Oh no, the 'lads' are back. How can Hamish & Hamish keep coming back to serve up the same rubbish over and over, and pollute our TV screen? Was it that channel 9 signed them on prior to their last Gap Year failure? Did anyone at Channel 9 think it was agood idea to persist with them? Whatever the reason, its no surprise that Hamish & Hamish are being wheeled out yet again, this time for the London Olympics. In what will no doubt be another cringe worthy flop, channel 9 will be thankful that the Olympics is only 2 weeks long. And naturally, this show is not an original idea. Its a rip off of the Roy & HG show during the 2000 Olympics. That was 12 years ago. Move on. But the main point of difference with Roy & HG was that they were already associated with sports and sports presenting. They were watchable, and they had enough substance and took their show seriously enough to produce some interesting interviews with some pretty impressive Olympic guests. 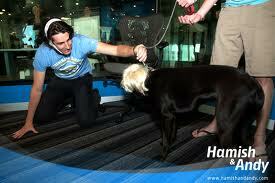 What guests will Hamish & Hamish have? No manager would let their elite sportsmen near them. Don’t expect Usain Bolt or Michael Phelps? No, if they’re lucky they’ll get some young Aussie nobodies who don’t know any better. By the end, Hamish & Hamish’s Olympic show will have as much to do with the Olympics as their Gap Year show had to do with New York City. I’m sure we’ll get to see some of their madcap hilarity around London – annoying Londoners on the tube, and being obnoxious to people who don’t speak English.